Have you been in a car accident? Are you suffering from neck or back pain, severe headaches or blurred vision? Even if you were in a minor car accident, “stiffness” and “soreness” can turn into more serious injuries. An evaluation from our car accident chiropractor in Boston is your best bet to ensure your pain doesn’t turn into more serious injury. Perhaps you’ve been in an auto accident several weeks or months ago yet are still suffering from pain. Charles Street Family Chiropractic offers drug-free treatments that are proven to help you down the road to recovery and restore your health. Contact our car accident chiropractor for you assessment and to start treatment today! Call 617-720-1992. Car accident victims often suffer severe pain, which negatively affects their work life and day to day living. If left untreated or an ineffective treatment is undertaken, symptoms can get worse and the recovery process can take much longer. One of the most common auto accident injuries is whiplash. This is because it only takes a 2.5 mile-per-hour change in speed to injure the neck, so even the most minor auto accident can result in whiplash. Since it may take time for you to begin experiencing symptoms, it’s important to visit a car accident chiropractor, such as Dr. Quigley, for an evaluation. It’s best to rule out any injury or identify it and start treatment immediately to ensure a fast recovery. While Dr. Quigley is highly-experienced as a whiplash chiropractor, he also has over 27 years’ experience in treating all injuries from car accidents. 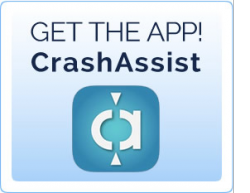 In fact, as a result of his extensive experience in treating the injuries of countless car accident victims, he’s created a Roadmap to Recovery in the form of a book, After The Car Crash, and an app, Crash Assist, for his patients and their attorneys. 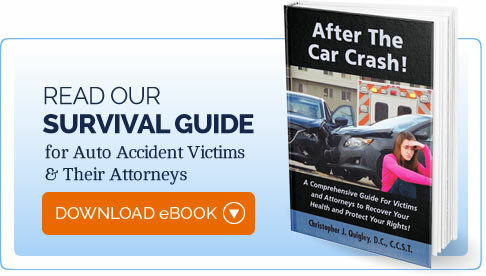 This book includes detailed information on what to do if you’re in an auto accident, how to handle insurance companies and how to quickly recover from your injuries. For the foremost expert in auto injury chiropractic care, contact Charles Street Family Chiropractic in Boston today. When you visit Charles Street Family Chiropractic, our chiropractor will first ask you to provide some background information about your symptoms and condition. We’ll then conduct a thorough chiropractic exam. In the case of auto accidents, we will likely want to see any x-rays or other diagnostic tests that were taken or ask you to have them done to gain a complete picture of your injuries. Once we understand what’s happening in your body, we’ll begin the treatment process and work to relieve your pain, restore mobility and support you in long-term healing so you can get your life back. Get back to living the life you love by letting us help your body heal, naturally. Contact Charles Street Family Chiropractic by calling 617-720-1992 to schedule an appointment. Request Your Own Preview of After the Car Crash Today!